©1999 [to current year] in whole and in part, world-wide and may not be used, copied or reproduced without the expressed consent of the under-signed author/producer. By purchasing this CD-ROM, you are hereby provided approval to use the product as per the conditions outlined in this document. All persons acquiring rights to use this CD-ROM, do so for their personal use only. 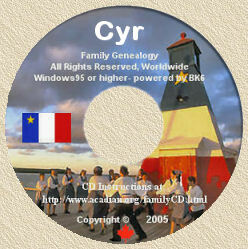 While every effort has been made to ensure the integrity of this Family Genealogy CD-ROM ©2002 [to current year], you agree to accept all responsibility for any physical, moral and material damage, or any other kind of loss which could occur using this product and the author/producer of this product, will not be held accountable or defray any monetary expenses which might result. All CD-ROM's are created from the same master and therefore cannot be defective. This combined with the fact that none of the genealogical information contained on the CD-ROM us encrypted and may easily copied, means we cannot accept returns and will not issue refunds once the shrink-wrap or seal on the jewel case, has been opened or tampered with. BK is the registered trademark of the shareware genealogical program "Brother's Keeper", written by and the exclusive property of John Steed. All rights are reserved on his behalf. All software and accompanying database material, is provided "as is" without warranty of any kind and the author/producer of this Family Genealogy CD-ROM, shall not be liable for any use (or inability to use) this product which is Copyright ©2002 [to current year] with "all rights reserved", worldwide.